​A soft top on any car leads a rather hard life – it has to cope with all weathers, possibly coping with snow & ice one week, and then dry, arid heat the next, it could expand or contract under the different temperatures, repel water, be resistant to the effects of the sun … very few products can do that successfully. Even humans struggle with it! ​Even if we discount going from one extreme to another, there’s still a lot to cope with – can you imagine being left out in the sun for a year? That’s going to dry you right out, and it’s the same with a soft top … they need some sort of conditioner to help them cope, but sometimes, even the best treatment can’t fix them up, and that’s the point where you need a new top. ​​ ... ​​soft top with vinyl windows, glass windows, flip top sunroof, with frame, without frame, new frame … so many different things to think about. ​Some of the choice depends on which particular Jeep model you have, but even then, you could still find quite a few different soft tops per model, I’ve just picked a selection of tops, for a selection of Jeep’s. ​The triple-layer twill fabric was offered as a factory option from the 2013 onwards Wranglers, but it’s standard with the Supertop​. It’s a 30oz triple layer, fully UV resistant fabric, which should mean it will last & last, give some sound deadening quality, and protect you from the elements. 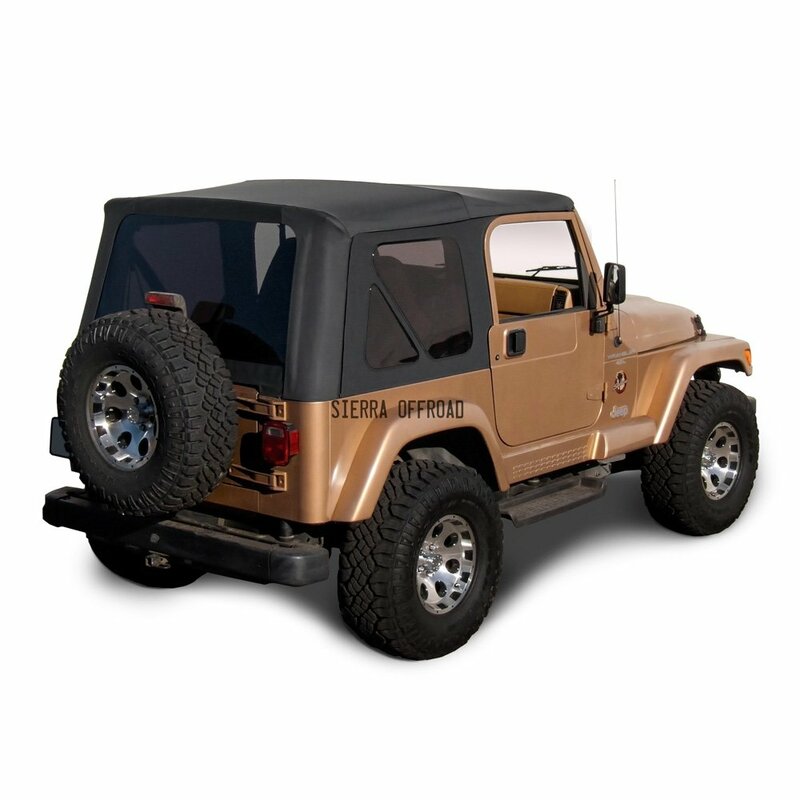 ​This ​jeep wrangler 4 door ​soft top​ is all about quality – high quality YKK scoop mounted zippers, powder coated (black) hardware gives a great finish, scratch-resistance and anti-corrosion properties, the 31% tinted windows are removeable (and made from thick vinyl), and Bestop give it a limited lifetime warranty. ​It has an adjustable bow system to keep the fabric taught, there’s a foldback ‘Sunrider’ sunroof, or you can fold the whole top down completely to really open up the vehicle. It comes with everything you need to completely replace the original top, including the patented door surrounds to give a factory look, fit & finish. ​This isn’t just a cheap replacement top, and as such it will take you around 4 – 6 hours to install it properly … ​and once it’s installed, you’ll just see the quality … it fits exactly right, it works as you want it to … there won’t be any moments of “if it just did …” regrets, this is quality, providing it’s fitted correctly. ​Pretty much at the opposite end of the range from the Supertop, the Smittybilt replacement top still does it all, ​at a fraction of the price. 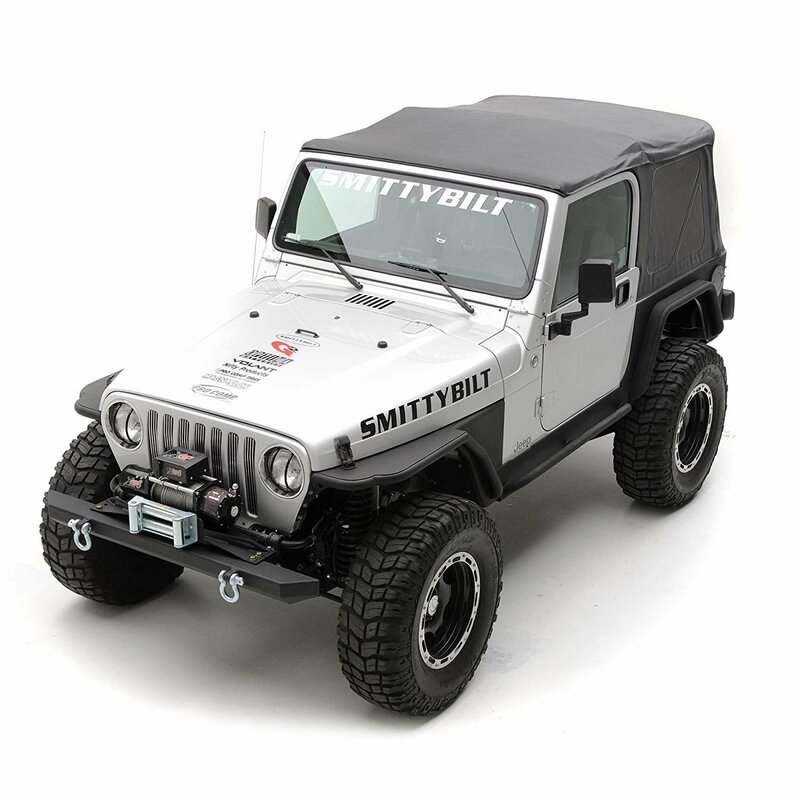 ​It’s made from marine grade, durable, vinyl coated fabric that replicates the OE style, all seems are heat sealed and the stitches are done with wick stop thread, which Smittybilt say they’re the only manufacturer to use this thread (I’m not so sure!). ​​Designed to use your existing hardware and framework, so it literally is just the fabric top, with tinted windows, the rear window can zip out entirely, giving you some breeze without having to completely remove the top. All of the zippers used are high quality and self-correcting, which should (in theory) mean that fitting it back together is simple. ​Come complete with front upper replacement door skins, side windows and rear window. Everything you need is complete in the kit, minus the hardware. It should take between 1 – 2 hours to fit, it’s quite simple and there’s plenty of instructional material on the web if you get stuck. ​This would be a great choice for someone looking for a well made, but cost effective replacement soft top. ​Another Bestop product (and there’s plenty more to come). 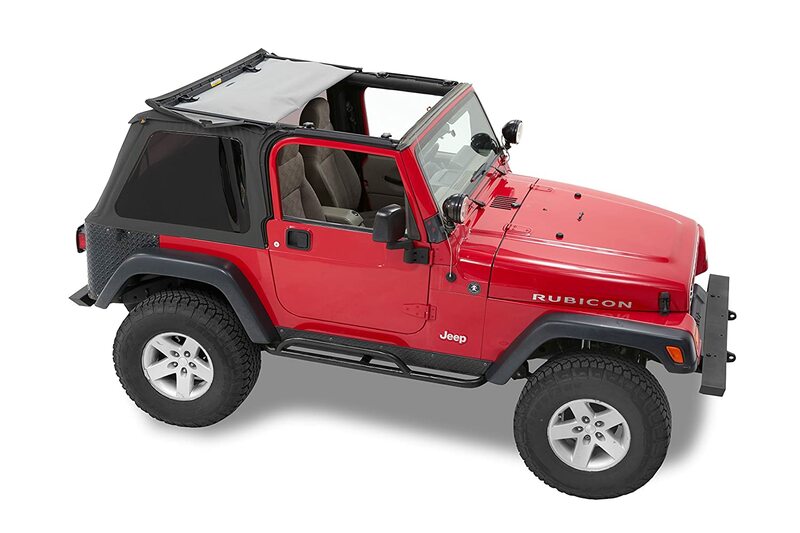 The kit comes with everything needed to convert from a hard top to a soft top – it’s a complete frameless replacement kit. ​The Bestop 56820-35 uses premium, factory-spec sailcloth fabric, which has the best in class UV resistance, and the tinted (18% tint) windows are removeable and replaceable. It offers ‘next generation’ styling, with a Sunrider sunroof, and the fit and the way it’s been designed means that you don’t need the traditional bows and frames to install. It’s compatible with any Bestop door kit, and will also fit the factory full steel doors … it’s a great fit and works well. ​Some features have been upgraded – these include the top arch bar system, quick release bow knuckles & factory style polymer door surrounds. It has a 2 year limited lifetime warranty, and includes absolutely everything you need to get it installed on a standard Jeep Wrangler, in around 1 hour. ​This is the most expensive soft top here, but it combines features from both hard & soft tops, that’s why it’s called a hybrid top. It has sliding side windows (glass, and tinted), a glass rear hatch with gas struts for easy lifting, and the rear glass has a defrosting system integrated, with OEM style connectors – it will connect right up to the standard wiring. ​The beauty of this top is that it’s more permanent, it weighs less than the standard hard top, yet still offers great protection and functionality … no zippers is a big thing, and if you’ve tried messing with the zippers on anything less than a super warm day, you’ll know why. 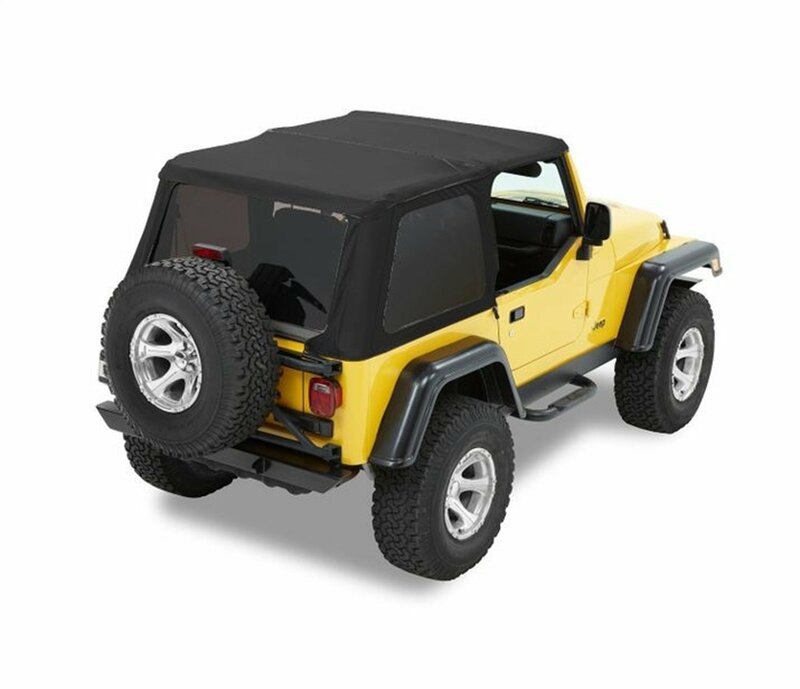 ​T​he 54853-17 Trektop Pro Hybrid Soft Top also features the Bestop ‘Sunrider’ sunroof panel, which flips back to give you an easy to use sun spot, although the whole top easily converts in to a safari bikini top without too much struggle. It’s made from a premium, black twill fabric that resists UV and fits just as you’d want it to. Comes with everything you need, including all the mounting hardware and door surrounds. ​It takes around 3 hours to install it properly, and time spent on installation is well worth it – don’t rush it. ​This is the cheapest soft top here, ​however, it’s still pretty decent quality … for me though, if I was looking to replace a soft top prior to selling a vehicle, this would be my choice​. It fits well enough, looks decent and the marine-grade vinyl coated fabric does a pretty good job of resisting fade through UV. ​Remember what I said about Smittybilt saying they were the only manufacturer to use wick stop thread … so does this Sierra top. ​It comes with tinted windows, but without the upper doors, and the zippers are heavy duty and self-correcting for an easier and faster fit. Thanks to the​ factory-style design, it's easy to​ fit ​in ​your Jeep’s original factory frame​​. Be warned that some buyers have reported an issue or two with regards to the rear window degrading over time. ​It takes around 1 hour to fit, and it works​. Sierra say that it’s manufactured to the original Jeep quality standard, but … I’d say there are better standards on the market. ​All in, it’s a great value soft top, ​and don’t expect it to last a lifetime in harsh climates. ​You can notice the difference in quality between this and the Supertop from Bestop … it’s a 23oz fabric compared to 30oz for the Supertop, but everything else you’d expect from a Bestop product is there. It has a flip back sunroof panel, the cloth is UV, stain and mildew resistant, and it uses factory specification marine grade thread with double stitching and heat sealed seams. ​The windows come tinted – 31% tint, and they’re removeable using the quality YKK zippers that are scoop mounted. The hood itself is compatible with pretty much any door arrangement – factory, full steel doors, upper fabric half doors and of course, the Bestop fabric upper half doors. ​It has a 3 year limited lifetime warranty, comes as a complete kit, and will take around 2 hours to install properly. ​Another Bestop, another great quality product that shouldn’t be as well priced as it is. 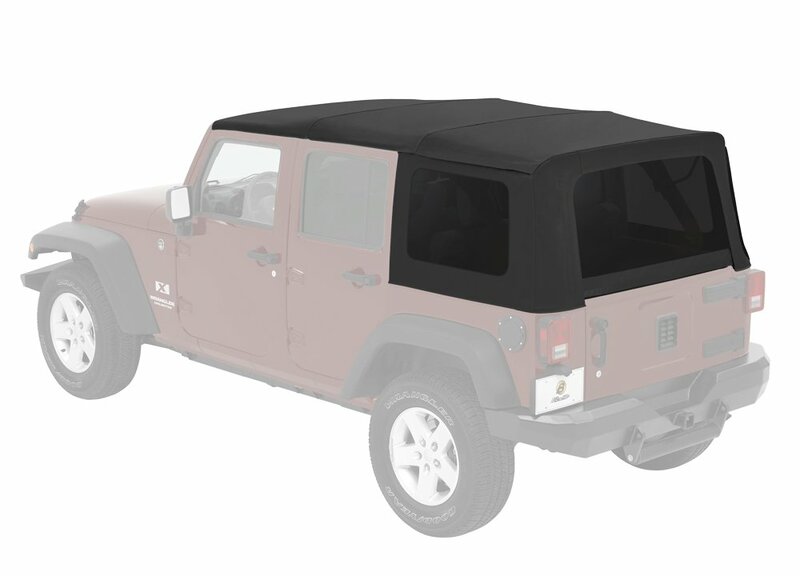 The Replay kit comes with soft top fabric, side & rear windows and upper door skins, but no hardware – it needs the factory bows, frames and tailgate bar. ​This is automotive grade fabric (rather than marine grade), which means it’s a little lighter (23oz rather than 30oz), and not quite so hard wearing. In all honesty, you wouldn’t really know the difference between the two, unless you did a direct, back-to-back comparison. ​31% tinted side and rear windows, heavy duty zippers and a 1 year limited warranty​. With it using, and fitting over the factory hardware, you need to ensure that it’s all in good condition before you start – don’t get stuck halfway through fitting (which should take about 1 hour) because the hardware isn’t good. 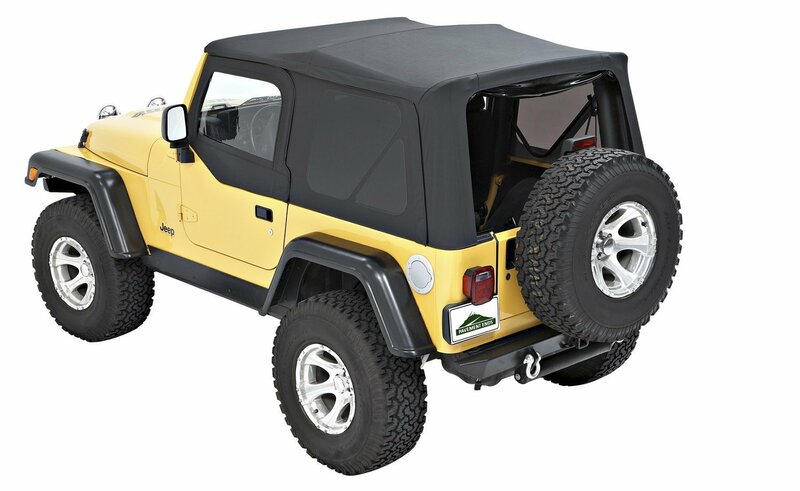 ​There are a lot of different tops, some are more of a temporary measure​, some are meant as a high quality replacement for the original Jeep top … you don’t have to spend the big bucks to guarantee a quality item, but it definitely seems that going up the budget gets you a longer lasting product – maybe not better quality, ​just longevity. ​Professional or at least, competent fitting is the key to making these soft tops work. If you rush the fitment, you’ll end up with something that sags, lets in water and is very noisy​. Take a few extra minutes to fully understand the fitting instructions before tackling the job – it’ll be worth it in the long run, guaranteed. ​Aside from that, try and do the fitting on a warm sunny day – leaving the top out in direct sunlight for an hour or two before fitting makes the process SO much easier. If a zipper feels tight, don’t force it – you may just cause irreparable damage.